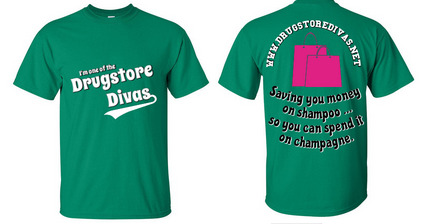 Have you heard of Drugstore Divas? It's a frugal lifestyle blog that was founded in January 2009. It features deals, coupons, recipes, reviews -- and is the host of this great t-shirt giveaway. Nine winners will win a Drugstore Divas t-shirt. You can choose whatever size fits you best. The front looks like a baseball tee, and the back has Drugstore Divas' tagline: Saving you money on shampoo ... so you can spend it on champagne. The shirts are really great quality and the letters won't peel in the wash. There will be nine winners total. Four will be selected by Lisa at Drugstore Divas for being the "biggest fan" and five will be selected at random. The winners must be US residents who are 18 or older. The giveaway starts now and ends at 11:59pm EST on August 3. To enter, just use the Rafflecopter below. Be careful about the email address you use in the Rafflecopter. It will be used to contact the winners, who will have 24 hours to respond before another winner will be selected. My blog was not compensated for this giveaway and is not responsible for prize fulfillment.